Why trust your septic tank services to a rookie? With over 50 years of providing service in the Gorge, Bishop Sanitation is a proven partner for residential and commercial septic tank service. Don’t wait until your system shows signs of failure to have your septic tank pumped out. Waiting can mean complete clogging and an expensive repair bill. When it’s time to schedule a service or if you need emergency service, just call. We’re ready to help 24/7. We offer peace of mind in the form of reliable, responsible septic service. Our state-of-the-art equipment, knowledgeable service techs and dedicated customer care staff will ensure your satisfaction as we provide prompt, reliable service at reasonable rates. Provided free of charge with every pump-out, this exclusive service details the operating conditions of your system and can help alert you to any possible problems. Customers of Bishop Sanitation are included in this program to help keep maintenance on schedule. Want to save more on your septic service? We offer a neighborhood discount for 2 or more households scheduled for the same day. Our portable restrooms will protect your septic system from overload during parties, picnics and special events at your home. Many restaurant owners are unaware of grease trap requirements and best practices. Regular maintenance is key. Hot water dissolves kitchen grease and deposits it into the plumbing lines. As this water cools, the grease congeals with debris in the water. It then sticks to the interior of your pipes. If you use a garbage disposal, this makes the situation worse by adding raw food particles to the congealed grease. If you fail to clean out your grease traps and tanks you will experience slow drainage, foul odors and eventually stoppage. Bishop Sanitation can get you on an automatic pumping schedule to avoid downtime. We’re also ready to handle your emergency calls 24/7. The Columbia River Gorge area is home to a growing number of craft breweries. 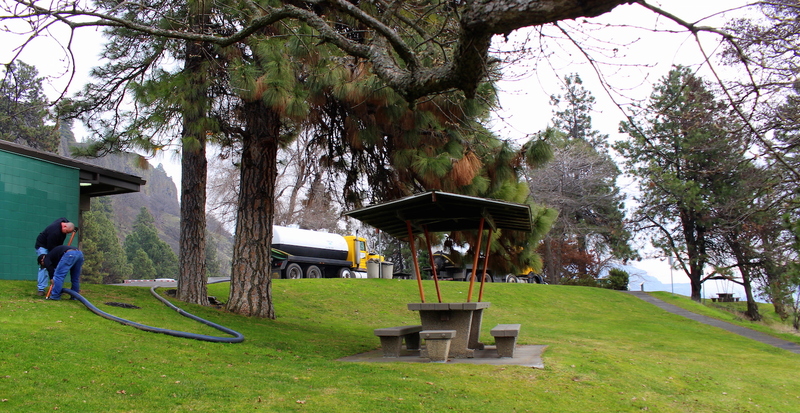 Bishop Sanitation is equipped to haul 100% of your brewery wastewater off site. That’s right, truck it off site. All of it. CIP water, spent yeast, floor cleaning water, waste beer, trub, everything. We’d love to give you a quote. Winery leftovers pile up fast and can cause some serious environmental problems if not disposed of properly. At the end of the day, something has to be done with the mess of grape skins and seeds and stems that comes out of wineries’ back doors. Give us a call and see how we can help. The first sign that your septic system needs a service is the presence of pooling water. This can occur in many areas, but pay close attention to the lawn in and around the drain field. Pooling water is one indication of a full septic tank. When the septic system is working as it should, waste water remains underground and out of sight. When solid waste clogs the drain field pipes, it causes water to collect and rise to the surface of your drain field. Water pooling in the grass around the drain field is the first tell-tale sign that your septic system needs service. Use your nose to help you determine how full your septic tank is. Household wastewater is ALL water sent down your drains. This includes water from toilets, bathroom & kitchen sinks, bathtub & showers, dishwasher and clothes washer. As the tank becomes full, it emits a foul smell. If you’re outside and you notice unnaturally stinky smells, especially around the drain field or above your septic tank, it may need to be serviced. When drains in your home run slowly, it’s an indication that you may need to have your septic tank pumped. If you’ve tried using commercial drain cleaning products in your sinks but the drains continue to empty slowly, try to remember the last time your septic system was serviced. If after using a plunger your toilet still drains slowly, your septic tank might be getting too full. An overly-full septic tank can cause sewage to back up into sinks, bathtubs or toilets. Along with slow drains, foul odors and pooling water, sewage backup is yet another sign that your septic system needs to be serviced. Sewage backup is usually black and smelly. If the grass growing above your drain field is lush and notably greener than in other areas of your landscape, it may be time to get your septic tank pumped. While some rising liquid is good, too much can indicate that a septic system failure of some sort is present. Offering both residential and commercial septic disposal and septic tank treatments since 1962, Bishop Sanitation’s team of pros trained in septic system maintenance has all the tools to fit your needs. Proper maintenance of your system can save you both money and hassle in the end. Call 509.773.4707 and talk to one of our friendly, knowledgeable team members today. A key reason to maintain your septic system is to save money! 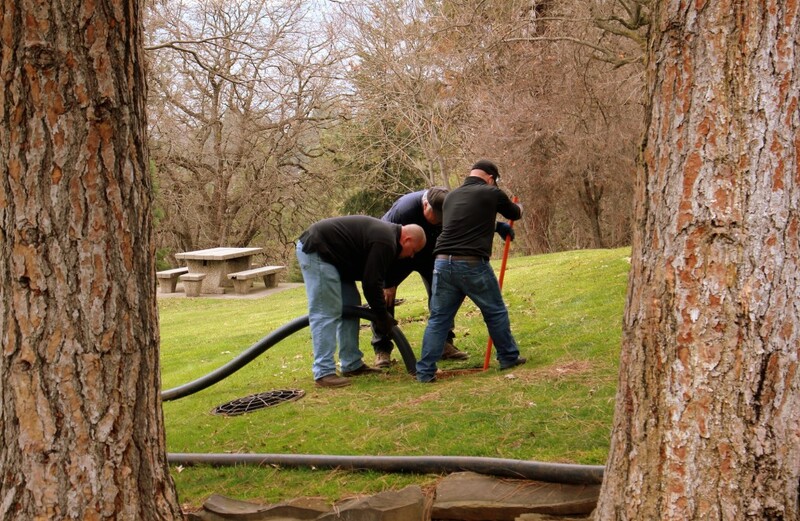 Failing septic systems are expensive to repair or replace, and poor maintenance is often the culprit. Having your septic system inspected (at least every 3 years) is a bargain when you consider the cost of replacing the entire system. Your system will need pumping every 3 to 5 years, depending on how many people live in the house and the size of the system. An unusable septic system or one in disrepair will lower your property value and could pose a legal liability. Luckily, following a few simple guidelines along with regular professional maintenance is all it takes to keep your septic system functioning properly for many years. Find the location of your septic tank, drain field. If you do not have the Plans-As-Built, draw one now, so you don’t have later. Check your tank regularly. (Health Department recommends every 3 years) The quickest way to plug up a drain field is when your tank fills up with liquids. Replace old rusted metal tanks. Call the Health Department for the correct information and permit fee. Restrict water use. Use low flow faucets and restrict amount of time in the shower. Also, spread out laundry and dishwashing over the week, not all done in one day. Fix even the smallest leaks quickly. A dripping faucet can send out gallons of extra water a day to the drain field. Don’t use a garbage disposal. This will only add more solids to your wastewater. Instead, compost or place vegetable waste in your garbage can. Don’t build on your reserve area or over your septic tank. Your reserve area is there for insurance so if your system ever fails, you have an alternate drain field location. Don’t abuse your drain field. You should not drive over, build over, or let horses or cattle roam over you drain field. Don’t plant trees over your drain field. Tree Roots can plug the lines. Don’t let rain run-off or hot tub water go through or over your system. This could overload the system and chorine, in excessive amounts is bad for the on-site septic system bacteria. Don’t ever enter into a septic tank, even if it is pumped. Dangerous gases can still be in the tank. This procedure is for determining the distance between the bottom of the scum layer and the bottom of the outlet baffle or tee. Attach a 6 inches square board on the bottom of a stick at least 6 feet long. At the outlet end of your tank’s first compartment, carefully push the stick through the scum layer to find the bottom of the baffle or tee. Mark your stick at the reference point to indicate the bottom of the scum layer. Raise the stick until you feel or see the stick contact the bottom of the scum layer. Mark your stick again at the reference point to indicate the bottom of the sludge. If the two pencil marks are 3 inches or less apart the tank needs to be pumped out. If the top of the scum is within one inch of the top of the outlet baffle the tank needs to be pumped. Lay the stick aside for later comparison with the sludge level stick. This procedure is for determining the distance from the bottom of the outlet baffle or tee to the top of the sludge layer. Wrap 3 feet of a white rag or old toweling around the bottom of a stick at least 6 feet long and fasten it with tape or string. Carefully lower the stick to the bottom of the first compartment. To avoid pushing it through the scum layer, lower the stick behind the outlet baffle or through the outlet tee. Hold the stick in the tank for a few minutes to allow sludge particles to adhere to the towel. Mark the stick at the reference point to indicate the bottom of the tank. Remove the stick carefully and note a distinct dark stain on the towel representing the sludge layer. Lay the stick beside the scum stick. Line up the top pencil marks. Measure the distance from the bottom of the scum stick to the top of the dark stain on the sludge stick. If the distance is 12 inches or less, your tank needs to be pumped. Or for those who would rather not deal with the sludge and slime protocol; call the pros at Bishop and we’ll handle it for you!